The Warrior I, a relatively simple exercise, is a weighted variation of the classic warrior yoga pose. As you do this yoga-with-weights exercise, you tap the energy of your heart and feel the strength, honor, and courage of a warrior. On a more practical note, the Warrior I works your biceps and legs. If you can, keep your hips squared throughout this exercise; neither hipbone should be forward of the other. If squaring your hips is too hard, however, forget it and do your best. Standing with your feet below your hips, your toes pointing forward, and the hand weights hanging at your sides with your palms facing inward, step back with your right foot and bend your left leg for support. 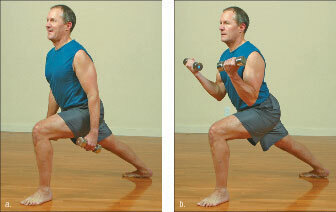 This is the lunge position — and the starting position. Turn out your back foot slightly and keep looking forward. Your bent knee shouldn’t be forward of your ankle. Also, press in with all four corners of your foot. As you exhale to a count of four, bend your elbows and work your biceps as you lift the weights to shoulder level. Draw your belly in and up and your tailbone down for support. Keep your elbows locked in; rocking isn’t allowed. As you inhale to a count of four, lower the weights to the starting position. Don’t let your back sag — keep it straight. Do this exercise six to eight times, pause to rest, and then do six to eight more repetitions.